The mid-20th century saw many examples of freeways severing organic ties between cities and their waterfronts or, in many places, reinforcing patterns of public disuse of waterside districts cemented by decades of intensive industrial, railroad, and port development. San Francisco’s Embarcadero Freeway, of course, was an early signal of an emergent public outcry against privileging the automobile over the pedestrian at the water’s edge. Taking cues from the freeway revolt in San Francisco, New Orleans activists brought aesthetic arguments to the fore in their battle against the Riverfront Expressway (originally planned by Robert Moses as part of an arterial expressway system for the Crescent City in the 1940s). Where San Franciscans failed, New Orleanians prevailed. They built upon their victory against the elevated roadway by eventually taking advantage of the port authority’s willingness to remove its hulking steel wharf sheds that had blocked views of the Mississippi River for many years. The result? A long promenade atop the river levee assured that tourists could saunter unimpeded between iconic Jackson Square and the Mississippi River. 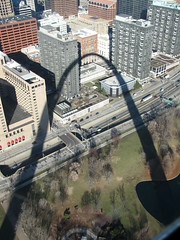 Now St. Louis – a city that cut off its riverfront from downtown even as it was erecting its signature Gateway Arch – is taking a bold step (reported in NextSTL and SmartPlanet) to create a true front yard for the city by relocating Interstate 70 away from the park space, another example of the enduring role that tourism, leisure, and recreation play in shaping and reshaping the landscape.